For the watchmaker Mido, the visionary architecture of a monument is synonymous with a mark of true design, just like the All Dial, which this year celebrates its tenth anniversary. 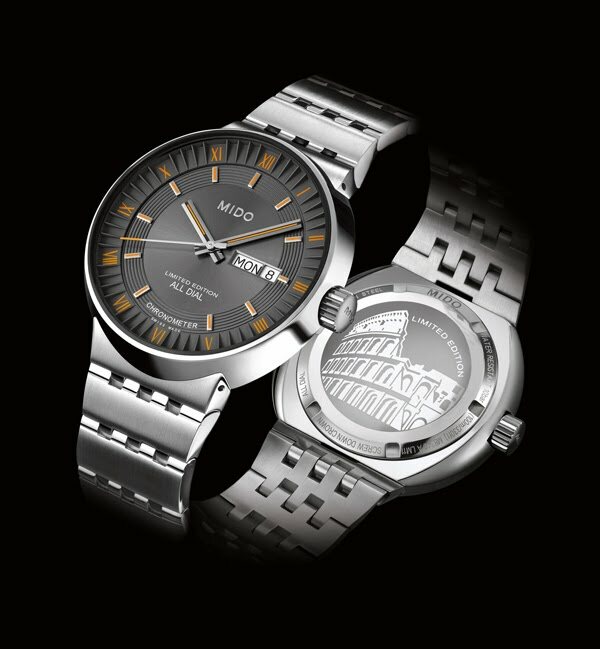 To mark the event, Mido has created a limited edition of 1,000 pieces. Drawing inspiration from the original, it pays homage to eternal Rome; the Coliseum is engraved on the case back of this COSC-certified chronometer, and the dial with its characteristic contours indicates the hours with Roman numerals. Following the example of other models, the incomparable design of this new All Dial is based on observation of one of the most famous artefacts of Roman history, the Coliseum. Designed according to the same ingenious concept, it is a beautiful evocation of this monument’s visionary architecture. This COSC-certified chronometer has an extremely accurate automatic movement that will satisfy every wish of the man who admires fine watchmaking and appreciates Swiss tradition and know-how. Presented in a limited edition, it features an engraving of the Coliseum on the case back, making this model unique. With a diameter of 42 mm, the dial exhibits contours reminiscent of those imagined by the architects of the Coliseum. Its anthracite centre with a sunray satinated finish creates a focal point of stunning elegance. In an attractive reference to Mido’s colour, the Roman numerals are orange, as are the applied indexes and hands treated with Super-LumiNova®. An anti-reflecting sapphire crystal treated on both sides makes it easy to tell the time. The model has a screw down crown. Automatic ETA 2836-2 certified COSC Chronometer, 11½’’’, Ø25.60 mm, height: 5.05 mm, 25 jewels, 28,800 A/H, INCABLOC and NIVACOURBE shock-absorber, NIVAFLEX NM mainspring, ANACHRON balance spring, GLUCYDUR balance wheel. Finely decorated Chronometer movement with blued screws, decorated oscillating weight with Geneva stripes and engraved Mido logo. Function HMSD+Day. Adjusted on 5 different positions for a high accuracy. Min. 38 hours power reserve. Stainless steel 316L, 2 pieces, sapphire crystal with an anti-reflecting treatment on both sides, screwed crown and case back, special engraved case back with the Coliseum and serial number, water-resistant up to a pressure of 10 bar (100 m / 330 ft). Sunray satinated anthracite centre, logo and indexes individually applied, indexes with orange Super LumiNova®, fine painted Roman numbers, date at 3 o’clock. Diamond polished, with orange Super-LumiNova® for easy readability at night.